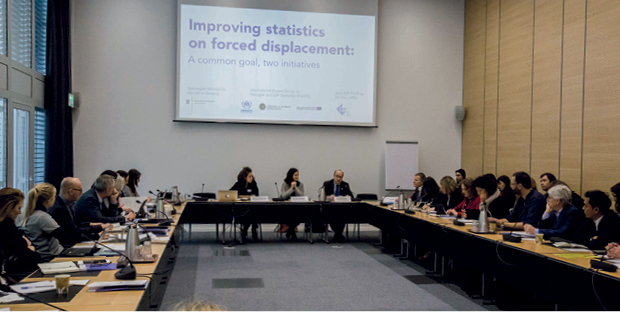 Together with the Permanent Mission of Norway to the UN and other International Organisations in Geneva, as well as the Expert Group on Refugee and IDP Statistics (EGRIS), we organised an event to tackle the topic of “Improving statistics on forced displacement” from two different perspectives. In this article we focus on the second part of the event bringing the attention to the Expert Group’s ongoing global effort to improve official statistics on forcibly displaced persons. To find out more about the first part of the event highlighting JIPS’ work and new strategic blueprint, jump over to this article. The EGRIS panel at the joint event on ‘Improving statistics on forced displacement”. Established in 2016 through a mandate by the UN Statistical Commission (UNSC), the EGRIS is an international collective of national statistical offices, immigration authorities and subject matter experts. Overseen by a Steering Group of UNHCR, Statistics Norway and Eurostat, the Expert Group is working to develop international recommendations, standards and guidance for the collection and production of both refugee and IDP statistics. With the ultimate goal of improving the quality of official statistics on these populations, the EGRIS is working closely with statistical authorities to ensure strong linkages with national planning, budgeting and policy processes alike. Why is the EGRIS important from a humanitarian perspective? How many humanitarians have worked with national statistical offices’ (NSO) staff members? Of the 60 people in the room only a few raise their hands. However, as Kimberly Roberson, Chief of Section at UNHCR and EGRIS Steering Committee member, underlines in her presentation, collaboration between humanitarians and national statistics offices is critical to achieve better data and more effective and sustainable responses to displacement situations. In addition, including displaced populations in official statistics is key to ensure that they are not left behind (see related Sustainable Development Goals indicator) and taken into account in national development plans. Why is the EGRIS important from the perspective of national statistical offices? Vebjørn Aalandslid, Senior Advisor International Department in Statistics Norway, agrees on the real need for improving coordination between the different actors producing statistics on forced displacement (national and international, humanitarian actors and statistics offices). Through its inclusive and collaborative approach with involvement from statisticians from around 40 countries as well as subject matter experts from the international community, the EGRIS is well placed to substantially contribute to this process. Large differences in capacities between countries. Working towards an international framework for statistics on IDPs, the IDP sub-group has elaborated a Technical Report on Statistics of IDPs taking stock of experiences and practices of involved countries and international actors. As Dag Roll-Hansen, Senior Technical Advisor at JIPS, explains, one of the key challenges for this Sub-group was to move from a legal to a statistical definition of “who is an IDP?” and to determine “when does displacement end?”. The Guiding Principles on Internal Displacement have served as a basis to elaborate meaningful statistical categories. After consideration of data sources for producing both numbers and characteristics of IDPs, as well as an analysis of coordination challenges, the report develops recommendations towards the development of a complete statistical framework for internal displacement. Benefitting from the active participation of 10 country representatives from a variety of IDP contexts, the Sub-group’s work has been able to stay grounded and concern itself with the reality on the ground as Dag Roll-Hansen highlighted in his presentation. Including forcibly displaced persons in national statistics can be the gateway to integrating them in national development plans, since, as Dag Roll-Hansen mentions, “informing national development plans and SDGs are among the most important purposes” of official statistics. We are looking forward to submitting both the International Recommendations on Refugee Statistics (IRRS) and the Technical Report on Statistics on IDPs for adoption by the UNSC in March 2018. As a next step we will start working on guidance for the implementation of the IRRS as well as the refinement of recommendations on IDP statistics and associated guidance. Planning is underway for but is likely to include the development of a digital and innovative tool (Compilers’ Manual), compiling existing tools, and capacity building modules, as well as enhanced efforts for strategic dissemination of these outputs.